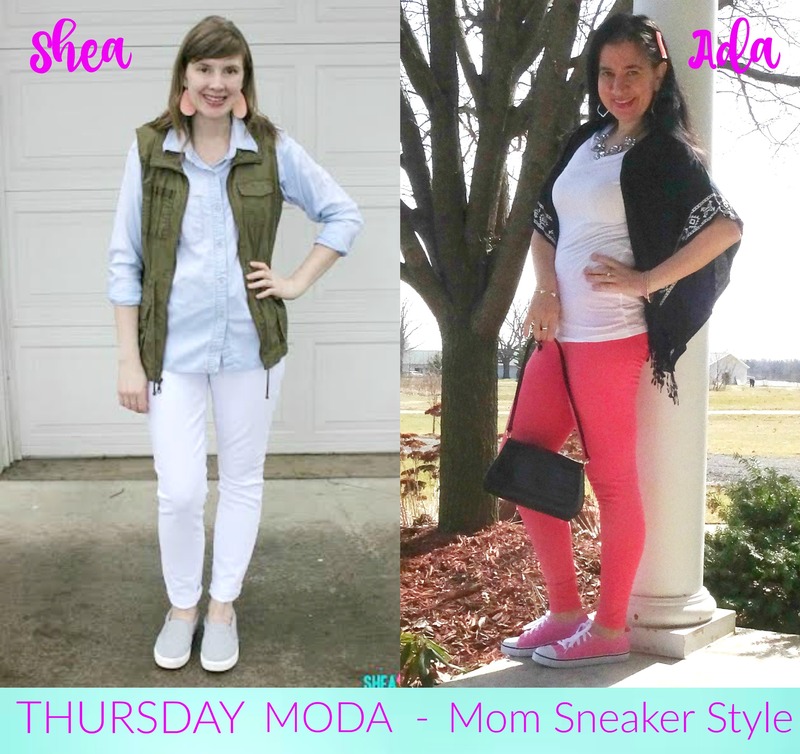 Thursday Moda #11 and Sneakers (plus Walmart). Happy Thursday Everyone! Thank you to all of you who linked up last week and welcome to a whole new linkup. Today I have Pretty Neon Pink Chucks for you... and you won't believe where I got them. ...Wal Mart! Yes, Wal Mart - that is where my Pink Converse-like Sneakers are from and so is the rest of this Outfit minus the Jewelry and the Bag. The Bag is vintage, courtesy of my mom and the Jewelry is borrowed from one of my Rocksbox-es. I loved how the Bright Coral Leggings and the Hot Pink Chucks worked together. That Black Kimono has white embroidery and some fringe in it. I cannot recommend my leggings and t-shirt enough. The leggings are so well-made, pretty thick and not see-through and these scoop-neck t-shirts are made of soft 100% cotton. I love that they are a tunic length. My sneakers are actually from the girls department. I am blessed with small feet (I wear a 6.5) and my pair is a 4 in girls' sizes. Basically my entire Cute Outfit from Wal Mart is under 40 bucks. This is an example of mixing high and low since all the jewelry and the bag are designer pieces. Have you ever shopped for your clothes at Wal Mart? They do have adorable clothes for kids and toddlers there by the way - so I suggest you check them out. I rarely shop there for myself when it comes to clothes but I lucked out with all these. This week's co-host is SHEA from Shea Lennon. We are both moms to very active toddlers who are just months apart in age and we are both showing our Casual Mom Sneaker (Spring) Style today. Shea will soon be adding another baby to her home, too. I have only discovered Shea's blog for about a year but I loved her blog so much I have even read several past posts. She has been blogging for over 6 years and hers is the perfect fashion and life-style blog. I love her everyday style. It is always chic even when she is dressed casually, like today. I have on Pink Chucks and she has on Neutral Slip-on Sneakers. She kept her outfit in neutral tones (love her utility olive vest) while I did add a huge dose of bright colors from the waist down. You should go by and say HI to Shea - you will love her cute blog! 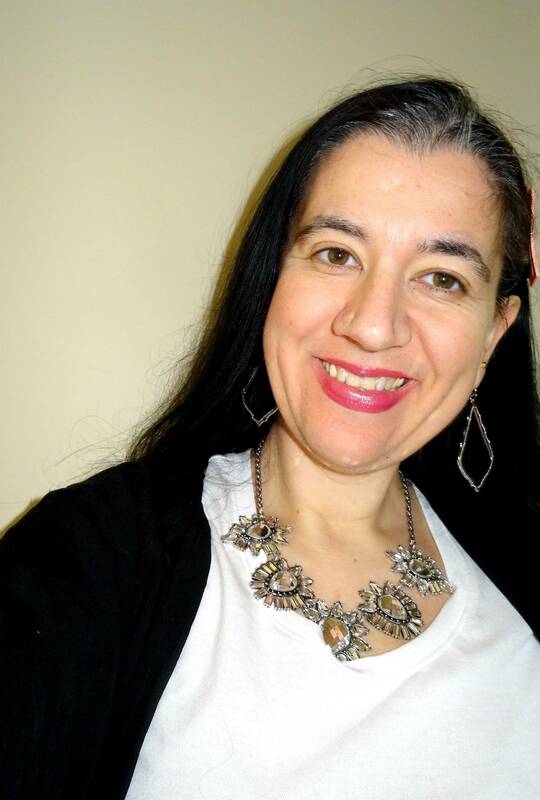 White Scoop-Neck, Short-Sleeve Cotton Tee: Wal Mart (New) (similar, Splurge), (similar), (similar, Steal). 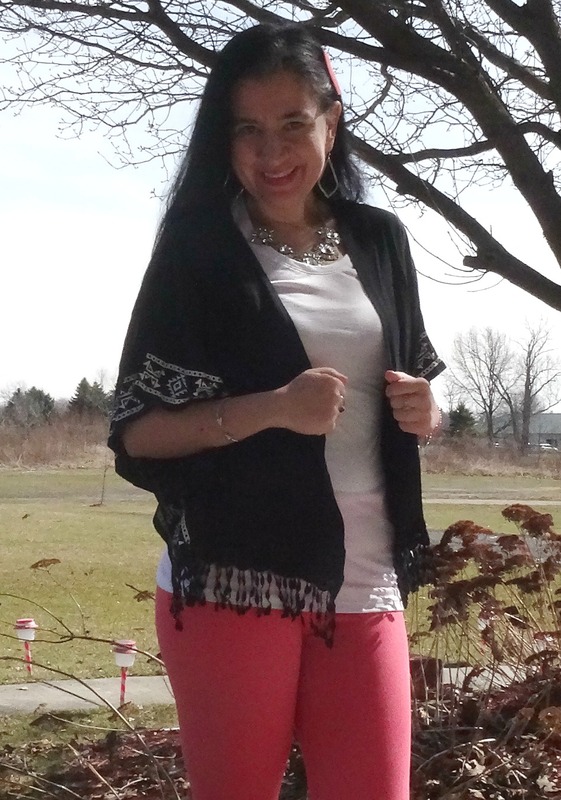 Cropped Black, Short-Sleeve Kimono w/ White Embroidery & Fringe: Wal Mart (New) (similar, Splurge, love this), (similar, Great Deal), (similar, Steal). Bright Coral/Orange Ponte Leggings w/ Pockets on the back: Wal Mart (New) (similar, on Sale, love these), (similar, Great Deal), (similar, Steal). Coral Sparkly Pave Chevron Hair Barrette: A Boutique in Albania. 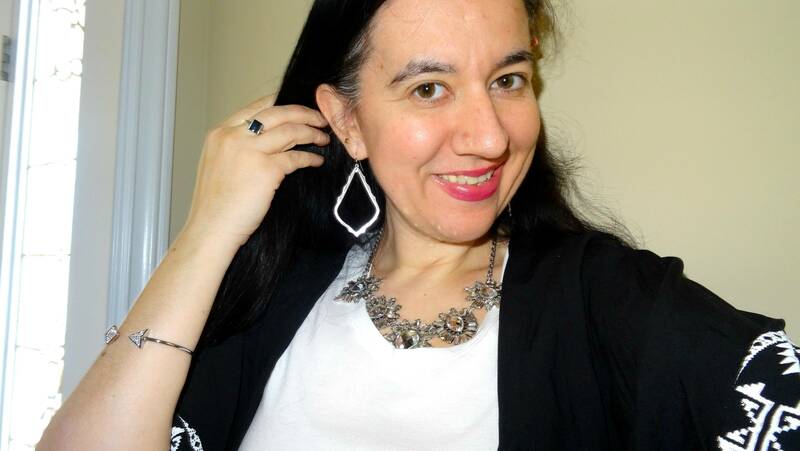 Bold Selina Crystal Necklace: Perry Street, borrowed via Rocksbox (New) (similar, Splurge), (similar, Great Deal), (similar, Steal). 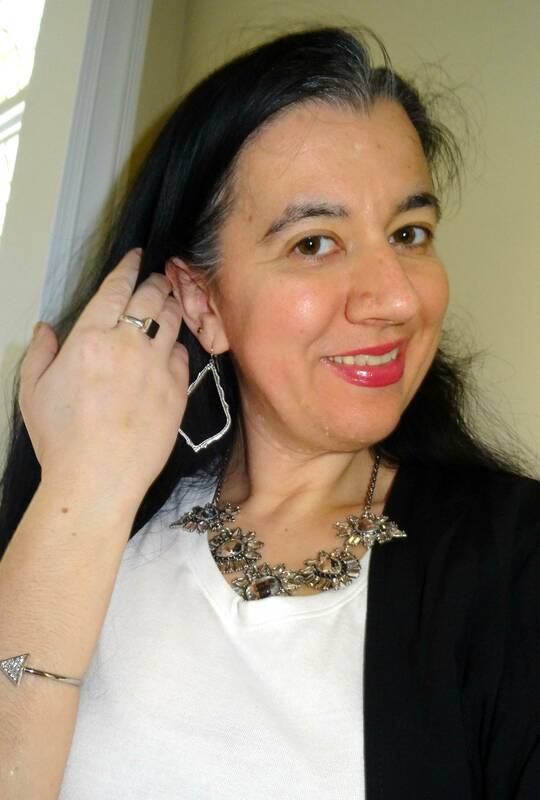 Sophee Drop Earrings in Silver: Kendra Scott, borrowed via Rocksbox (New) (identical), (similar, Splurge), (similar, Steal). "Follow Your Arrow" Cuff Bracelet in Silver: Slate, borrowed via Rocksbox (New) (similar, Splurge), (similar, Great Deal, love this), (similar, Steal). Silver Ring w/ Square Black Onyx Stone: Zales (similar, Splurge), (similar, love this), (similar, Steal). Black Faux Alligator Handbag w/ Long Handle: Vintage (Borrowed from Mom) (similar, Splurge), (similar, Great Deal), (similar, Steal, love this). Bright Pink Canvas (Chucks) Sneakers: Wal Mart (New) (very similar, the real deal, Great Deal), (similar, on Sale), (cute slip-on style, Great Deal), (similar, Steal). You can still use my special code to get a free month of Rocksbox jewelry delivered to your home: ADABFF39. 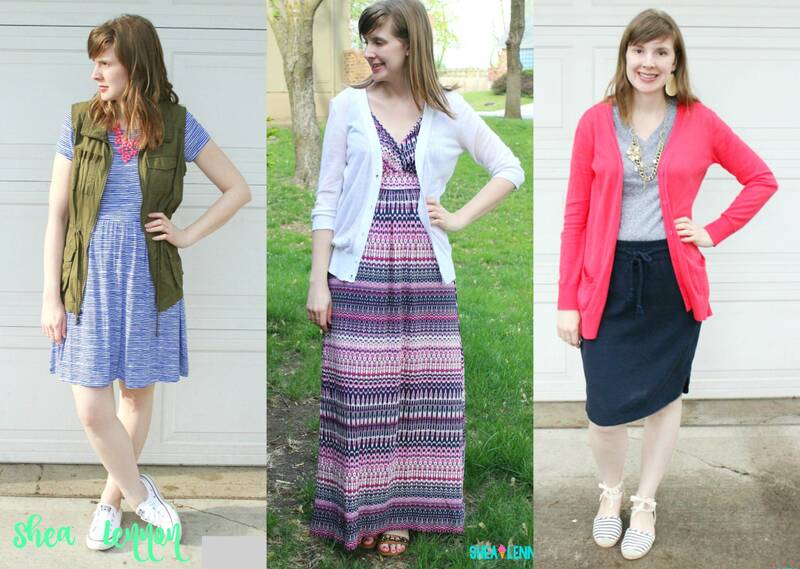 This week's featured blogger is EMILY from Darling, Dearest. 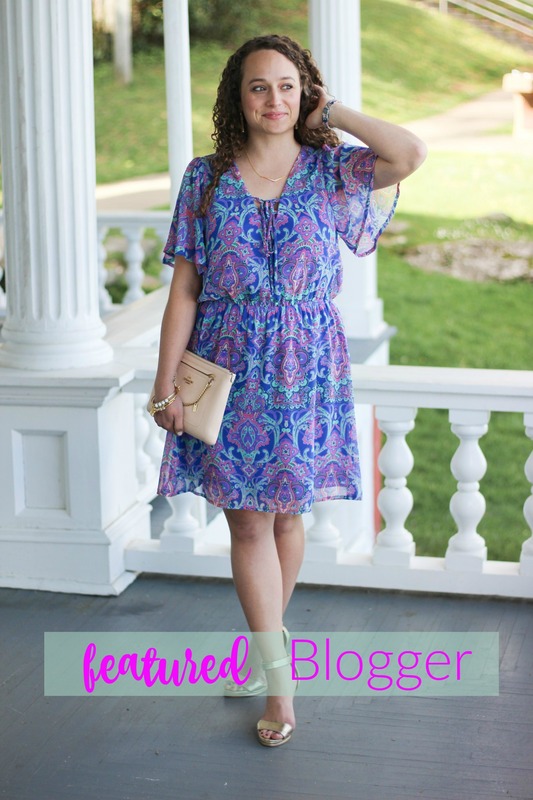 Emily linked up the prettiest Floral Paisley Dress which has the prettiest bright yet soft colors (IT colors of the year: Rose Quartz and Serenity plus Lavender). The length of this dress is perfect and the sleeves are so romantic. You can dress it up like Emily did with her neutral clutch and gold heeled sandals and go to a Spring Wedding wearing it, but I can see it dressed down also, like for Memorial Day Weekend with some flat sandals or canvas slip-ons. You may remember Emily from my very first linkup. 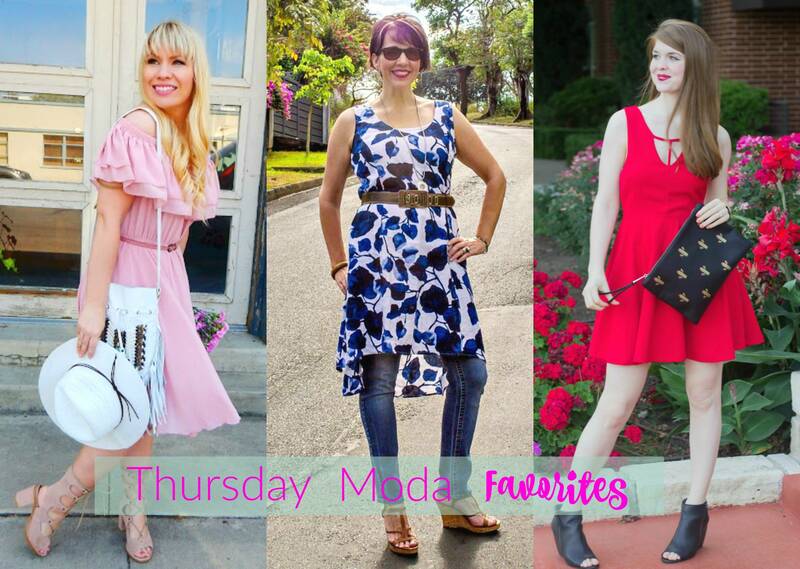 She co-hosted "Thursday Moda #1" with me and collaborated with me on a Blanket Scarves styling week, that same week. I have only been reading Emily's blog for a while but I love what she writes and every outfit she posts. She is one stylish teacher. Make sure you check out her blog and follow her, also. Lizzie is 'All Laced Up' in her Beautiful Rose Quartz Off-Shoulder Dress with Adorable Block Heel Sandals and a Panama Hat, complete with Fresh Flowers. 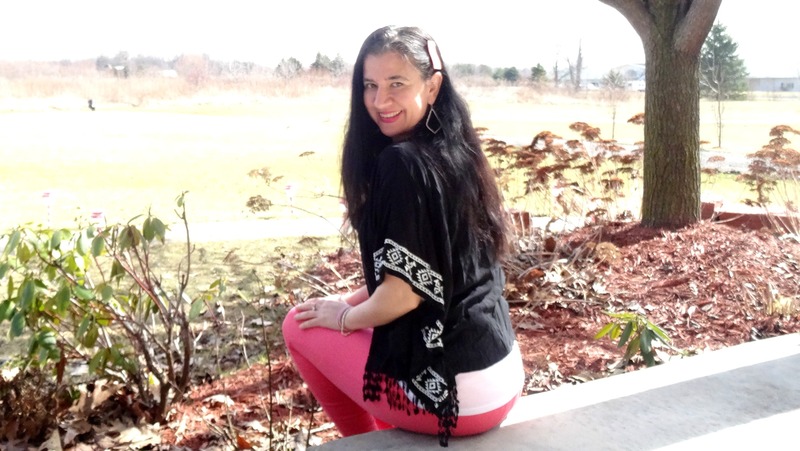 Shellie claims to 'Rock Skinny Jeans over 40' and she is not joking. I love her fabulous Blue Rose, Hi-Lo Dress Over the Skinny Denim. Lauren feels like a 'Dancer Emoji' in that Stunning Red Dress - you've got to see the back! Love her Edgy Booties and Adorable Cactus Clutch. Thursday Moda Co-Host: Shea Lennon. Take a sneak peek of some other cozy and chic looks from Shea, just three of my favorites (below). 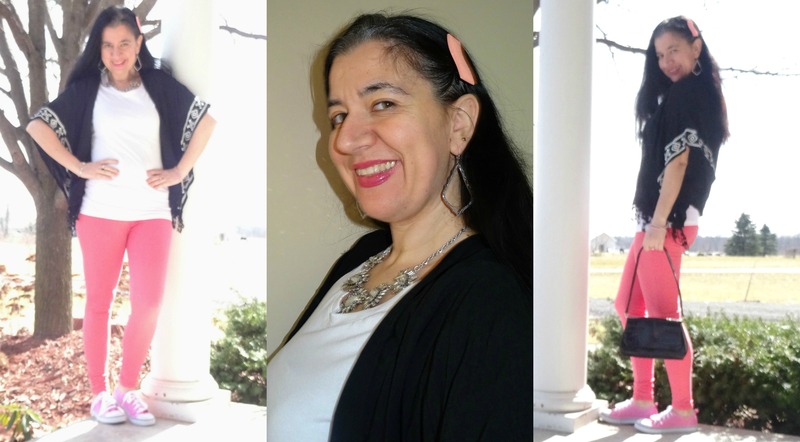 "Hi Elegance and Mommyhood readers! I'm so thankful to Ada for letting me co-host today. I’m an ice cream-obsessed working mom living in the suburbs of Kansas City (go Royals!). I created Shea Lennon as a fashion and lifestyle resource for busy, stylish women on a budget. I share articles that showcase affordable, attainable style, recipes, and other lifestyle ideas to help you live a more creative life. Other than my blog, you can also find me on Pinterest and Instagram." Jaymie, Jennie, Joules, Jolynne, Karli, Kelly, Lauren, Linda, Liz, Melissa with Sheree + Rachel, Michelle, Nancy, Nicole, Osy, Rachel, Sheela, Tara, Tara (Socialite), The Blended Blog, Vicki and The Wardrobe Stylist. Also linking with the ladies of The Blended Blog. And now join the linkup!